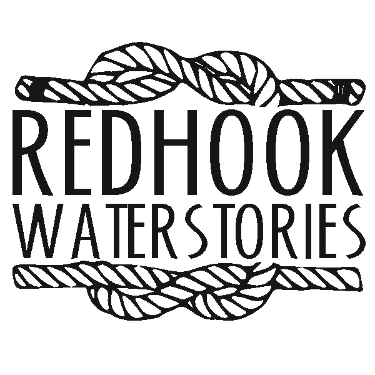 As the world's appetite for grain got bigger so did the Erie Canal barges that wended their way to the grain terminals in Brooklyn's Red Hook. Ground was broken for the Erie Canal in 1817. When it was completed in 1825 it connected Lake Erie with the Hudson River allowing grain and other produce to travel in barges across New York and the Midwest to grain terminals in Red Hook - to be eaten by the many in the metropolitan area or loaded into ocean going ships. The warehouses of the Atlantic Docks, completed in the early 1840s, and Erie Basin, built in the 1860s, stored much of the nations grain while merchants made their deals and then directed the grain along the next leg of its journey. When first built the Erie Canal averaged 4 feet deep, 40 feet wide, and floated boats carrying 30 tons of freight. To keep up with increasing demand the Canal was expanded and in turn the barges traveling up and down its length got bigger. By 1862 the canal was 70 feet wide and 7 feet deep, and could handle boats carrying 240 tons. 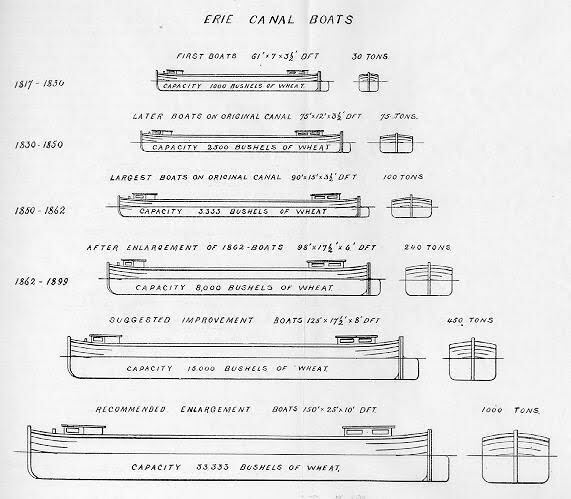 An illustration on the growing capacity of Erie Canal boats shows that the first generation (1817 - 1830) had an average capacity of 1000 bushels of wheat. The capacity more than doubled to 2500 bushels in the period of 1830-1850. In the 1850s the largest barges that could travel the original canal were built., carrying over 3000 bushels, they were 90 feet long and 15 feet wide. After the enlargement of the Erie Canal, barges carrying 8,000 bushels of wheat would arrive in Brooklyn.